Indiana’s 2018-19 season came to an end on Tuesday night with a 73-63 loss to Wichita State in the quarterfinals of the NIT at Simon Skjodt Assembly Hall. After falling to 13-14 with a loss at Iowa on Feb. 22, the Hoosiers won six of eight to finish the season at 19-16. · In familiar fashion, offense stalls out: Indiana’s offense was an issue for most of the season and Tuesday night’s performance was no different. Against an aggressive and physical Wichita State defense, Indiana shot just 38.5 percent from the field and was blocked nine times. The Hoosiers shot just 40.4 percent on 2s, well below their season average, and couldn’t get anything going from the perimeter, either. The Shockers outscored Indiana by 15 points from beyond the 3-point line. An Indiana season that began with promise was derailed in large part due to inept perimeter shooting that never improved. Whether Archie Miller and the coaching staff can solve the problem in the offseason to avoid a repeat in 2019-20 is arguably the biggest offseason storyline for the program. 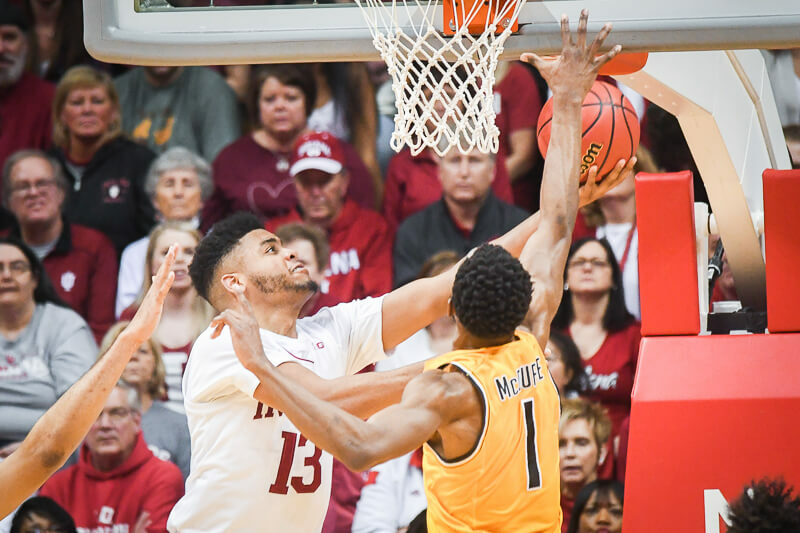 · Morgan leaves it all out there in final appearance: Despite appearing in just one NCAA tournament as a freshman, Juwan Morgan will be remembered as a fan favorite in Bloomington. Morgan, who played out of position for the better part of two seasons, was relentless on the floor and maximized his talent over his four year career. His performance on Tuesday was the final example of carrying a major load for a team that was limited offensively. Morgan finished with a team-high 21 points on 8-for-15 shooting and added six rebounds, three blocks, an assist and a steal in 35 minutes. · Hot perimeter shooting propels Wichita State to victory: Indiana’s poor perimeter shooting was certainly an issue in the loss, but give Wichita State for making some difficult perimeter shots in the victory. The Shockers hit 11 of their 29 3-point attempts and many of them helped grab momentum back when it appeared Indiana may take a lead. Wichita State entered the game ranked 320th nationally in 3-point shooting percentage, but the Shockers picked the right night to get hot. Four different Wichita State players hit a 3-pointer, but the performances of Dexter Dennis (5-for-7) and Markis McDuffie (4-for-12) were the difference. · Indiana’s inability to get to the line was surprising: Although perimeter shooting was never a strength for this IU team, the Hoosiers did excel at getting to the free throw line. Converting, of course, was another story, but on paper, Tuesday’s game looked like an opportunity to outscore an opponent on free throws. Wichita State entered with one of the worst team free throw rates (FTA/FGA) in the country (288th) and an even worse opponent free throw rate percentage of 39.7, which ranked 321st in the country. But Indiana was outscored by 11 points at the line as its free throw rate of 20 percent was its fourth worst mark of the season. Wichita State’s free throw rate of 45.5 percent was its best in a game since a win over Rice back on Nov. 25 and its third best all season. · Another long offseason begins with plenty of questions to answer: For a third straight season, Indiana missed the NCAA tournament and there will be an expectation from the fanbase to get back there in Miller’s third season at the helm. The Hoosiers, however, are losing Juwan Morgan to graduation and Romeo Langford will likely be on an NBA roster next fall. Is there a path to an NCAA tournament appearance next season in Bloomington? The first and most obvious fix this roster needs is perimeter shooting. Whether it is developed in-house or the staff brings in some shooting from elsewhere, it must be addressed. The health of Jerome Hunter, who was expected to be one of IU’s better players this season, also looms large. How much will freshmen Trayce Jackson-Davis and Armaan Franklin be able to contribute from day one? Beyond that, Indiana needs several returnees to make significant offseason gains. A returning nucleus of Al Durham, Devonte Green, Rob Phinisee, Justin Smith, De’Ron Davis and Race Thompson is strong, but all of them have work to do in the offseason. With six months until the start of practice, there are plenty of questions that need to be answered in Bloomington. When asked what the keys to the offseason would be, Miller wasn’t ready to comment on Tuesday night.